In sub-Saharan Africa, it is common to observe that less reputable traders and their fake goods are infiltrating the markets and gaining access to legal supply chains through tempting discounts. Hunting for these bargains is common procedure for consumers in Cameroon. It is a matter of survival for families with low and irregular income. This sets the a scene in which the trade of falsified and substandard quality medicines is flowering. People are not aware of the risk or just ignoring it. Even when buying cheap medicines to treat Malaria. This may end deadly when the counterfeit medicines is a complete failure with no active ingredient, filled with empty hope. Working on the detection of falsified medicines for over fifteen years, we at the Global Pharma Health Fund (GPHF) thought we saw it all. However, in this field, surprises are always looming around the corner. Screening the quality of vital antimalarial medicines in each and every corner of the world with our Minilab, we teamed up with the German Institute for Medical Mission (DIFAEM) for some minor drug quality checks in Cameroon this year. Collected from the open markets in Yaoundé, Douala and some other towns, staff from diocesan pharmacies and faith-based healthcare centers discovered that in three leading ACT antimalarial brands, some batches contained no active pharmaceutical ingredients. Furthermore, an outdated generic SP-type of antimalarial medicine with no pyrimethamine and traces of sulfadoxine was found. Whether this was based on malpractice or outright fraud may be decided in court; the end result for patients, however, is life-taking rather than life-saving. In one case, a vigilant pharmacist observed that some ACT tablets from the public sector supply seemed to have no therapeutic effect and sent some samples to the Presbyterian Church of Cameroon running a GPHF-Minilab as a first-line of testing. Additional compendial analysis at the Mission of Essential Supplies in Nairobi, Kenya, later confirmed that all actives, artemether and lumefantrine, were missing. In the case of another ACT medicine intended for sale in the private market sector, the spurious batch contained no dihydroartemisinin or piperaquine phosphate. 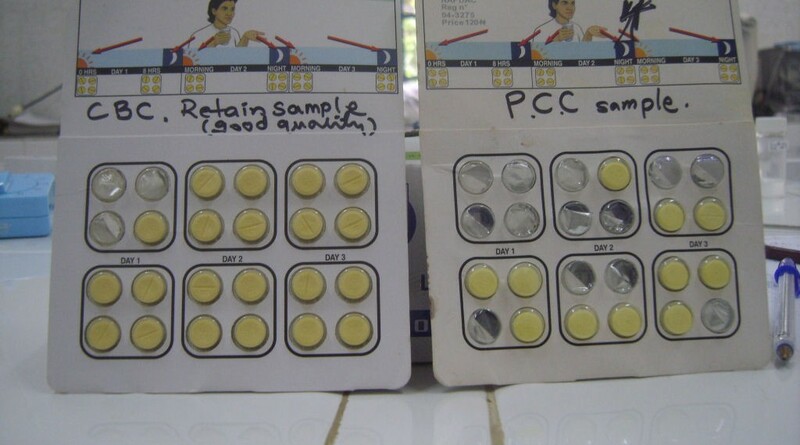 The packaging and labelling were close to perfect, however, the tablets had some apparent flaws, most likely intentionally, as dealers in fake medicines wish to avoid consuming their own deadly product. As counterfeit versions of these anti-malarial medicines may continue to appear in the market and deceive people into thinking dangerous fakes are genuine, increased vigilance throughout the different supply chains is strongly advised in Cameroon and neighboring countries. The GPHF-Minilab® is a mini-laboratory developed by the Global Pharma Health Fund to boost the medicines testing capacity at healthcare providers in developing countries. Focus of testing is on vital essential drugs, for example anti-infective medicines. It is a non-sophisticated and affordable tool fit for use in the field and it has already been supplied 630 times to 89 countries. Minilabs save lives. For more information, please visit: www.gphf.org.